The award was launched on 7 April 1995 and is now in its 23rd year. TWO IRISH NOVELS have been shortlisted for the International Dublin Literary Award. The Award is worth €100,000 to the winner – making it the most valuable annual prize for works of fiction published in English. 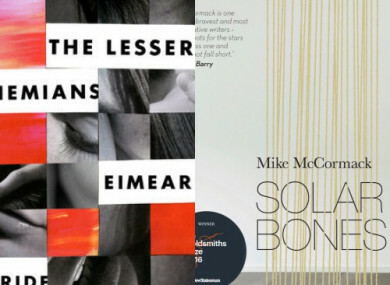 The Lesser Bohemians by Eimear McBride and Solar Bones by Mike McCormack are the two books by Irish authors that have been shortlisted for the 2018 prize. The 10 shortlisted titles have been chosen by an international panel of judges. Overall 40 countries were represented with 150 books originally being longlisted in November. There are also six novels in translation from France, Germany, Italy, Norway, Mexico and South Korea and novels from South Africa and the USA. If the book has been translated the author receives €75,000 and the translator receives €25,000. The Unseen by Roy Jacobsen (Norwegian) Translated from Norwegian by Don Bartlett & Don Shaw. Published by MacLehose Press. Distant Light by Antonio Moresco (Italian) Translated from Italian by Richard Dixon. Published by Archipelago Books. The award, sponsored by Dublin City Council and managed by Dublin City Libraries, was launched on 7 April 1995 and is now in its 23rd year. Dublin’s Lord Mayor, Ardmhéara, Mícheál Mac Donncha said, “The titles on this year’s shortlist were nominated by public libraries in Canada, Estonia, Germany, Hungary, Ireland, Italy, Mexico, Norway, South Africa, Spain, Switzerland and the USA. This is the beauty of this award; it reaches out to readers and authors worldwide, while also celebrating excellence in contemporary Irish literature represented on the 2018 shortlist by Eimear McBride and Mike McCormack. The five member international judging panel, chaired by Hon. Eugene R. Sullivan, will select one winner which will be announced by Lord Mayor, Ardmhéara, Mícheál Mac Donncha,on Wednesday 13 June. Email “Two Irish novels shortlisted for literary award worth €100,000”. Feedback on “Two Irish novels shortlisted for literary award worth €100,000”.